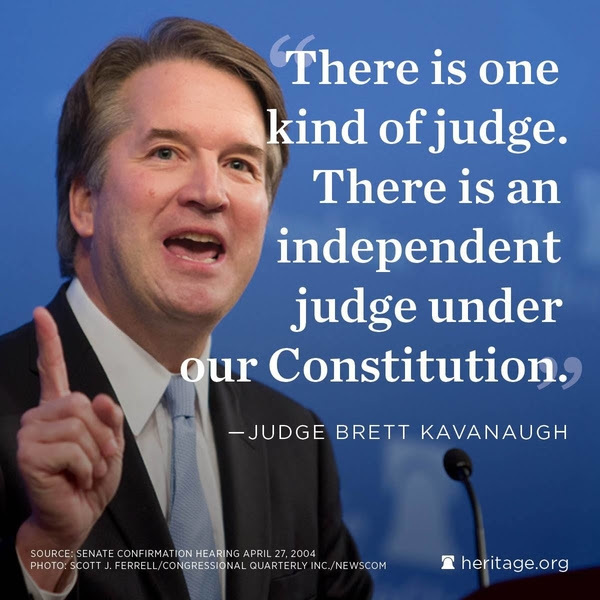 The Agenda -> Brett Kavanaugh is the right choice for America. + Trump must go into Putin summit with eyes wide open. Brett Kavanaugh is the right choice for America. President Donald Trump announced last week his nomination of D.C. Circuit Judge Brett Kavanaugh to succeed Justice Anthony Kennedy on the Supreme Court. Kavanaugh, who was included in The Heritage Foundation’s original list of potential Supreme Court nominees, is a very promising choice. “Judge Brett Kavanaugh is known for many things—and fairness, impartiality, and faithfulness to the Constitution are chief among them,” writes Heritage President Kay Coles James. Check out our collection of research, commentaries, and videos on Kavanaugh and the process of confirming a Supreme Court justice. Trump must go into Putin summit with eyes wide open. Today, President Trump will meet with Russian President Vladimir Putin in Helsinki, Finland. It’s important that Trump is strong, clear, and consistent with Putin, writes Luke Coffey, director of Heritage’s Douglas and Sarah Allison Center for Foreign Policy. “Putin has never shown that he can be a trusted partner of the United States. At almost every opportunity, he has pursued policies that undermine America’s national interests and those of its closest partners. ” Read Coffey’s new report on the issues Trump must address with Putin. Trump hits the nail on the head at NATO. Last week, at the 2018 NATO summit in Brussels, President Trump called out Germany for it’s recent oil and gas deals with Russia and pushed for NATO countries to increase defense spending. While some European allies and American NATO supporters were worried about the rhetoric, Trump’s concerns are valid and Heritage has consistently raised concerns about the very issues Trump brought up. Learn more about NATO and the most vital issues that must be addressed. This week on the “Heritage Explains” podcast, Elizabeth Slattery, a legal fellow in Heritage’s Meese Center for Legal and Judicial Studies, discussed how long it could take to confirm Judge Brett Kavanaugh and what real roadblocks he could face. Listen to the podcast. In a special summer episode of “SCOTUS 101,” John Malcolm, vice president of Heritage’s Institute for Constitutional Government and director of Heritage’s Edwin Meese III Center for Legal and Judicial Studies, joins host Elizabeth Slattery to talk about attending the huge SCOTUS announcement at the White House. They also dig into SCOTUS nominee Brett Kavanaugh’s background and the highlights of his time on the D.C. Circuit. Listen to the podcast. Wednesday at 9:30 a.m., Heritage and the Taiwan Foundation for Democracy will host a set of distinguished panels of experts to discuss Chinese relations with Taiwan, and the United States’ role in diplomacy. Watch the event live. Wednesday at noon, Mona Charen, a senior fellow at the Ethics and Public Policy Center, will discuss how modern feminism has lost touch with science, love, and common sense. Watch the event live. Thursday at 12:30 p.m., Heritage will host Sen. Marco Rubio, R-Fla., to discuss the threat that “deep fakes” and associated technology pose to privacy, the free market, and American democracy. Watch the event live. Friday at noon, join The Heritage Foundation and the National Review Institute for a panel discussion on how to be a better advocate on college campuses. A set of distinguished panelists will offer practical, easy ways to be a more effective and persuasive leader for freedom. Learn more about featured speakers and watch the event live. Kay Coles James, president of The Heritage Foundation, joined Fox News’ “The Daily Briefing with Dana Perino” to discuss U.S. interests around the globe, including the NATO summit, Brexit, and the Supreme Court justice nominee. Watch the interview. John Malcolm, vice president of Heritage’s Institute for Constitutional Government and director of Heritage’s Edwin Meese III Center for Legal and Judicial Studies, joined CNBC’s “Squawk Box,” Fox Business’ “Lou Dobbs Tonight,” and Bloomberg Business to discuss the nomination Judge Brett Kavanaugh to the Supreme Court. James Carafano, vice president of Heritage’s Kathryn and Shelby Cullom Davis Institute for National Security and Foreign Policy and E.W. Richardson fellow, joined Fox News’ “Fox & Friends First”, Fox Business’ “Countdown to the Closing Bell” and Fox Business’ “Mornings with Maria” to talk about President Trump at the NATO summit and achieving complete dismantlement of North Korea’s nuclear weapons program. Dakota Wood, a senior research fellow for defense programs at The Heritage Foundation, joined Fox News’ “America’s News HQ” to discuss President Trump’s calls for NATO members to pay their fair share. Watch the interview. Peter Brookes, a senior fellow for national security affairs in Heritage’s Allison Center for Foreign Policy, joined Fox News’ “Your World” to discuss the NATO summit. Watch the interview. Luke Coffey, director of the Douglas and Sarah Allison Center for Foreign Policy, joined Fox Business’ “FBN a.m.” to talk about President Trump’s approaching summit with Vladimir Putin, his comments about Brexit, and his visit with British Prime Minister Theresa May. Watch the Interview. Ambassador Terry Miller, director of Heritage’s Center for International Trade and Economics and the Mark A. Kolokotrones fellow in economic freedom, joinedFox Business’ “Countdown to the Closing Bell” to discuss the unintended consequences of imposing tariffs. Watch the interview. Nile Gardiner, director of Heritage’s Margaret Thatcher Center for Freedom, joined Fox News’ “Tucker Carlson Tonight” and Fox Business’ “Cavuto Coast to Coast” to talk about President Trump’s visit to England, along with the NATO summit and German-Russian relations. Elizabeth Slattery, a legal fellow in the Meese Center for Legal and Judicial Studies, joined BBC World News to discuss President Trump’s nomination of Judge Brett Kavanaugh to the Supreme Court, his judicial philosophy, his effect on the abortion debate, and the upcoming confirmation fight. Watch the interview. Tori Whiting, the Jay Van Andel trade economist in Heritage’s Roe Institute for Economic Policy Studies, joined Fox News’ “The Ingraham Angle” to talk about the Trump tariffs going into effect and trade wars. Watch the interview. Hans von Spakovsky, a legal fellow in Heritage’s Meese Center for Legal and Judicial Studies, joined Fox News’ “Fox & Friends” to discuss Peter Strzok’s contentious testimony and the failure of congressional Democrats to conduct correct oversight of the department. Watch the interview. David Kreutzer, a senior research fellow in Heritage’s Institute for Economic Freedom and Opportunity, joined Fox Business’ “Cavuto Coast to Coast” to discuss President Trump’s hard stance on trade following the Brussels NATO summit. Watch the Interview. Watch Judge Brett M. Kavanaugh deliver Heritage’s 10th Joseph Story Distinguished Lecture last year.